NFPA 30 defines flammable liquid as a liquid with a flash point does not exceed 100º F/38C or lower, while a combustible liquid has a flash point of 100º F/38 C or higher. Most manufacturing facilities that handle and store chemicals have a well thought out fire plan design to minimize fire risk as they are familiar with flammable and combustible liquid materials. Safe storage with the proper ventilation is essential for your health, safety, and fire protection. Fires can occur in a cabinet, in a room, or in cables or ducts (see duct protection). Flammable liquid fires don’t respond well to water and it can leave the water toxic. 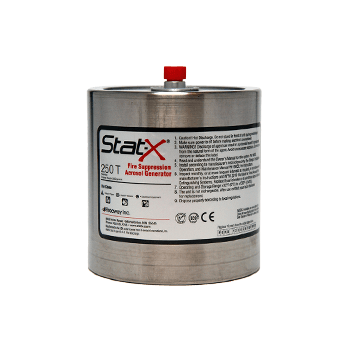 A properly designed Stat-X® fire suppression is vital for saving lives, containing the fire, and limiting property damage and downtime. 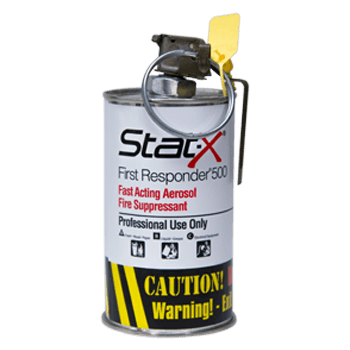 The Stat-X® chemical compound suppresses the fire by interruption the radicals of the fire. Extinguishment is primarily by interference with the flame chemical reaction due to huge population of micro-particles surrounding and penetrating the flame, particle surface will absorb heat so minor flame cooling is a secondary benefit. Stat-X does NOT deplete the oxygen. Stat-X® is an EPA Snap Listed total flooding Halon 1301 replacement and an alternative to clean agent gas and water solutions.